Merle & Velma is putting a modern twist on a classic keepsake.. the blanket. 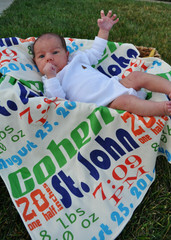 They have designed personalized keepsake blankets with baby's name in a variety of type and color. Each keepsake is made with with 100% organic fabric, printed with non-toxic water based dyes and Made in the USA. They also have Personalize Birth Story blankets that share the name, weight and length, and birthdate. What a heirloom for a little one just coming into the world. I reviewed a Personalized Name Print Lovey with the name Faith. This 12 by 12 lovey is the perfect size for an infant, and oh so soft! The front is an organic cotton, digitally printed with baby's name on it. Backed with a super soft minky, mine in purple but you can also choose pink, teal or brown. I know from experience that minky is a bear to sew with so I paid attention to that when reviewing. Perfect corners and seams! Merle & Velma is an experienced seamstress! Great to know when you are entrusting your little one with one of their blankets. Great quality and a fantastic idea for new babies. Something Mom and Baby will enjoy for years! My 5 year old still loves on a lovey at times, so don't think they are just for infants either! *Side Note :As with any toy or blanket however I strongly recommend not putting it in their crib or removing once they are asleep. That is really cool! What a lovely keepsake. I love it! This is a wonderful baby gift for anyone. I would love to get this for my nephew who will be born soon.